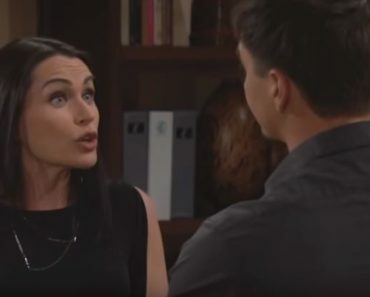 The Bold and the Beautiful fans saw Brooke confront her husband, and it did not go well. For one, he did bribe the judge to make the decisions that he made. And then there is the fact that Ridge simply does not feel badly about that at all. He is not the kind of man who regrets his decisions as long as they work for him and make him happy. He is good with his decision, and he is not about to change his mind about it. But, his wife is not happy about it. She’s not thrilled that he went out and did this, or that he made this is mission, or that he is going to make things worse for anyone else. There is very little that they can do to make this situation feel less like a thing, but she will not drop it. She’s furious, even though it’s all over and everyone is happy. Despite the way things turned out in the courtroom, it appears that Katie and Bill are bonding over their newfound love of their son. Perhaps they didn’t do the parenting thing right in the beginning, but they seem to be getting it under control right now. They seem to have some issues that they can work with at the moment, but they don’t seem to have much they can go with otherwise. They are getting along. She’s impressed with his parenting, and there is not much else that we can say about that other than we are happy to see that this little boy is going to see to his parents get along – and he might just have a longterm relationship with his father after all. That’s good news. We agree. They are phenomenal together, and they totally have the best relationship on screen for men who hate one another. We do imagine they must be pretty good friends in real life to have this kind of situation with one another. It’s good stuff to watch on screen. Steffy has some questions for her dad, and they all have to do with his issues with his own wife. She’s not happy in her marriage, and it’s obvious to Ridge’s daughter that there is something going on that they cannot handle. They have a lot of stuff going on in their lives, and they don’t want to make a bigger mess of it, but she needs to know that her father is going to be all right. She’s noticed her stepmom and dad seem to have some marital issues, and that her stepmom sided with her own ex-husband rather than her own sister at the custody hearing. She knows her father did something to the judge to make the ruling go the way it did, and she knows there is an issue. Will Ridge open up to his daughter about his issues, or will he make it a point to stop what he is doing to make it worse? And then there is a little bit more going on with Brooke. Now that she knows what happened with her husband and the judge, she feels guilty. She’s not loyal to her husband at this point. She’s almost totally loyal to Bill, and she’s going to allow her guilt to make her want to tell him what is going on. Will she continue to feel guilty, or will she allow her guilt to make her betray her husband and do something totally stupid by telling Bill what Ridge did? She could end her marriage doing that.